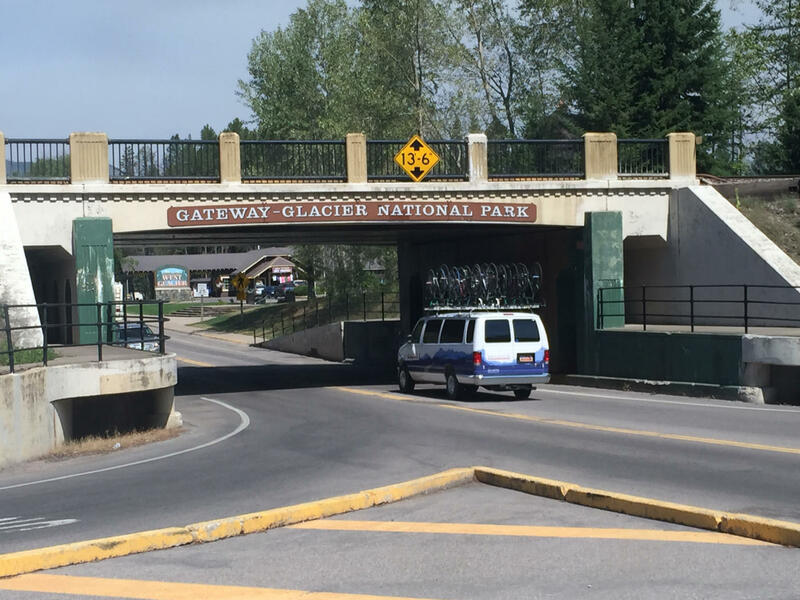 glacier national park is a cycling destination you should experience. I did. The Mountains Were Calling… and So I Went. 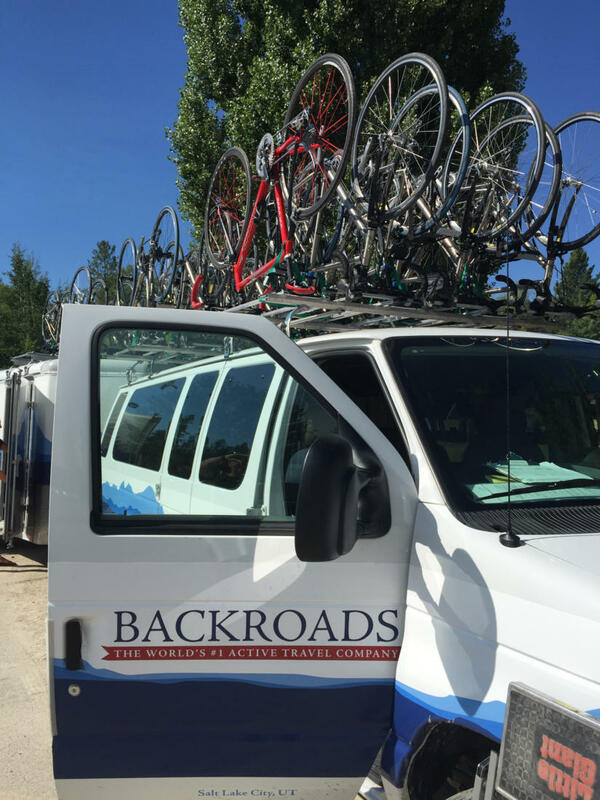 The Backroads van picking us up in Whitefish, Montana. Glacier National Park (Carlinthecyclist.com) Since I live in the mountains of Southwest Virginia, John Muir’s famous line, “The mountains are calling and I must go,” is sort of like background noise – an ever-present calling that is answered every day –simply by being here. In order to break through that hum, I needed to go bigger. Waaaay bigger. And so Mary and I celebrated our 30th anniversary by joining friends on a Backroads bicycle trip to Glacier National Park, the southern tip of the Canadian Rockies. We traveled in early August of 2015, Flying from Roanoke to Kalispell via Chicago. 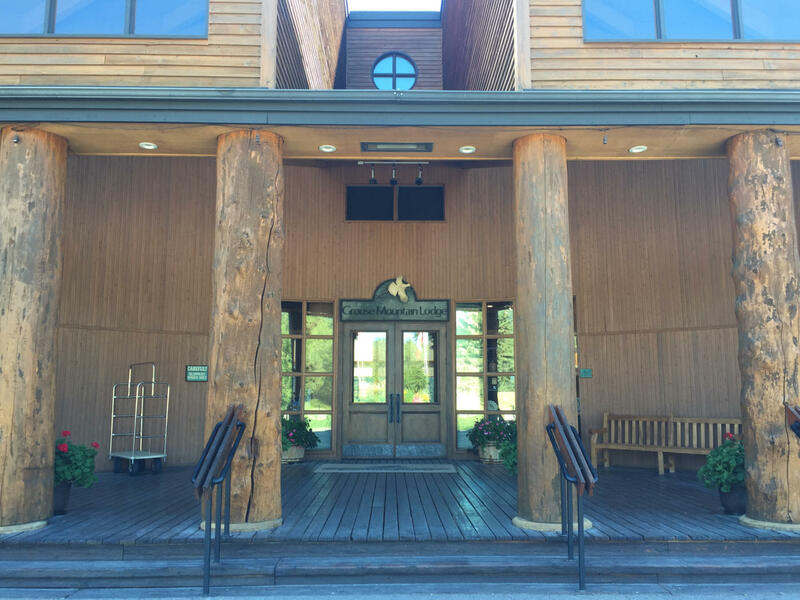 From Kalispell, the shuttle took us at no charge back to the Grouse Mountain Lodge, in Whitefish, where we would spend two nights on the front end of our cycling adventure and also the final night before the return trip. The view from the roof of Casey’s looks out over town with the ski resort in the background. 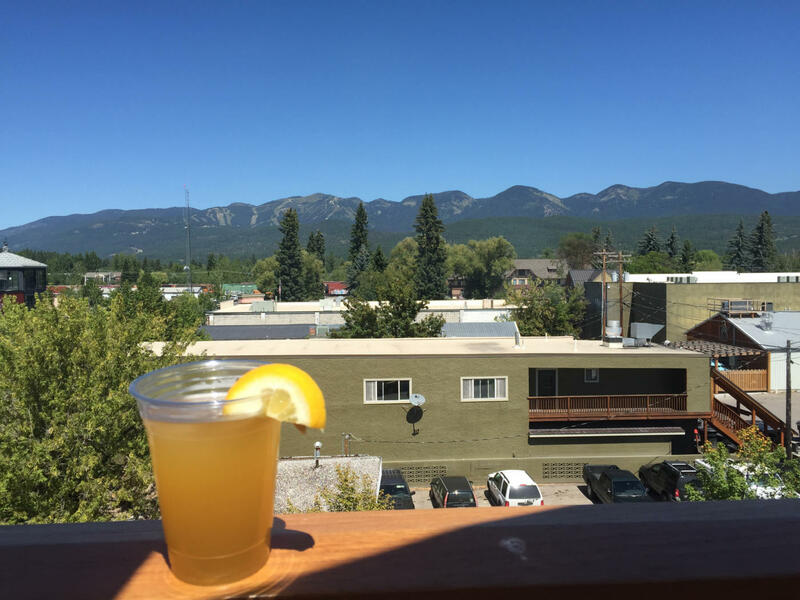 Whitefish is a great little ski town with a nice summer vibe. The small downtown is crowded with restaurants and café’s, a couple of micro-breweries and lots of artsy and outdoor shops. 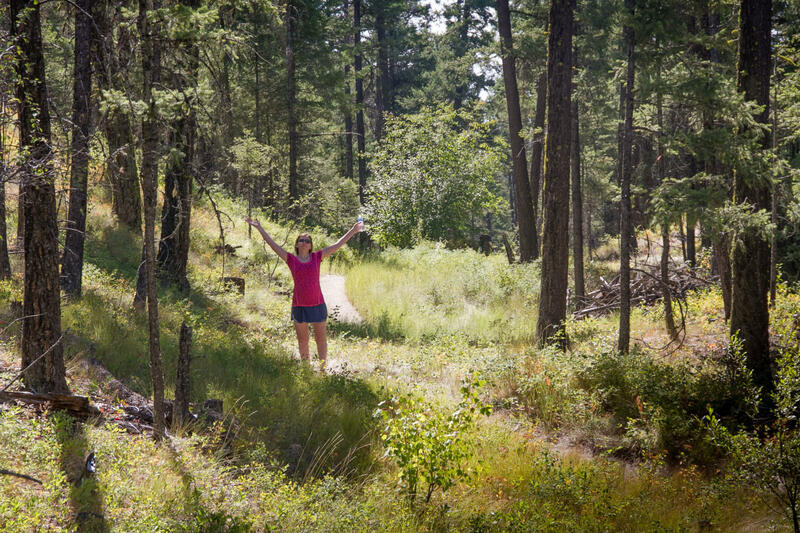 The city is also working on a trail network known collectively as the Whitefish Trail. 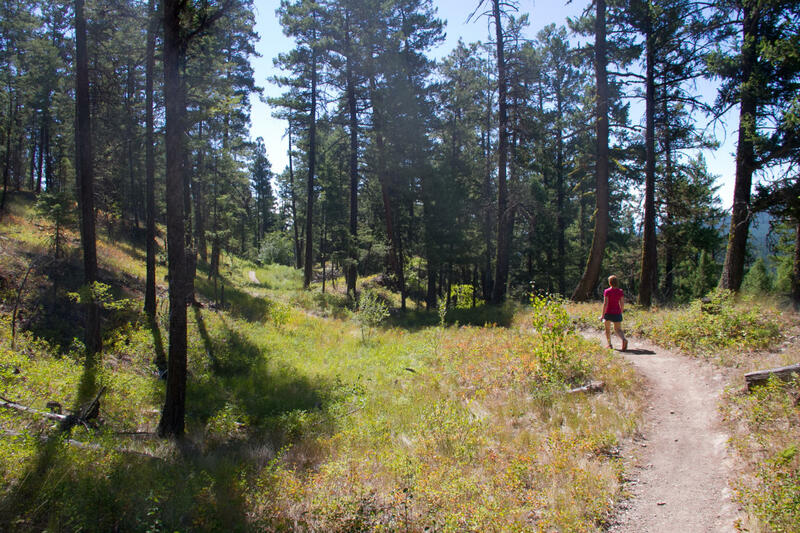 It consists of a series of routes, which while not connected, offer a variety of options for hiking, mountain biking and horseback riding. 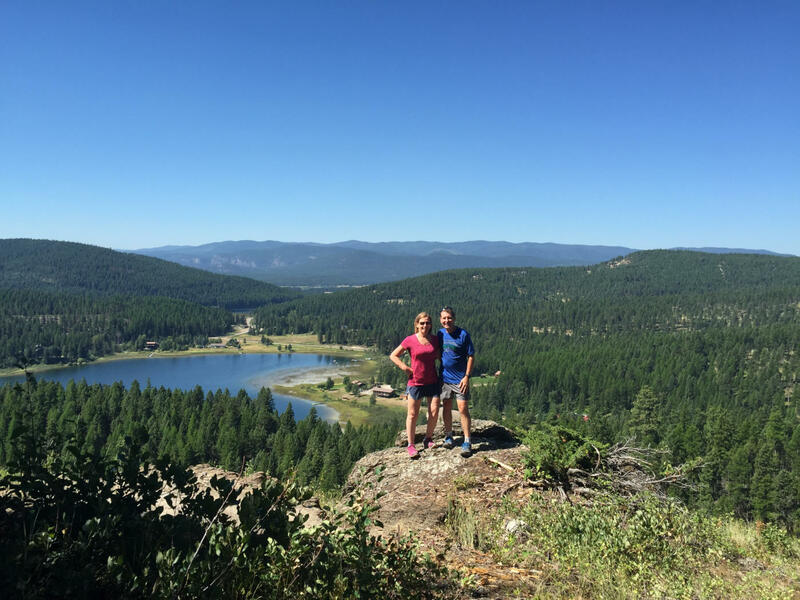 Mary and I arrived a day before the rest of our party and took the chance to hike Lion Mountain – an easy three miler with rolling terrain that lead to a beautiful view of Skyles Lake. Mary on the Lion Mountain section of the Whitefish Trail. The view from the top shows Skyles Lake in the Background. Profile of the Lion Mountain Hike. The trail surface is much smoother than trails in the east. We enjoyed the hike, and snapped some pictures from the top, reveling in the fact that we were in Montana. Later, we explored downtown Whitefish wishing we had worn shorts as the temperature was well into the 90’s. We ate lunch on the roof at Casey’s restaurant, looking out over downtown at the Whitefish Mountain Resort, where the ski trails were obvious even in summer dress. I made a note to myself that Whitefish could be all the destination that I needed, and a stop in winter might be in order. 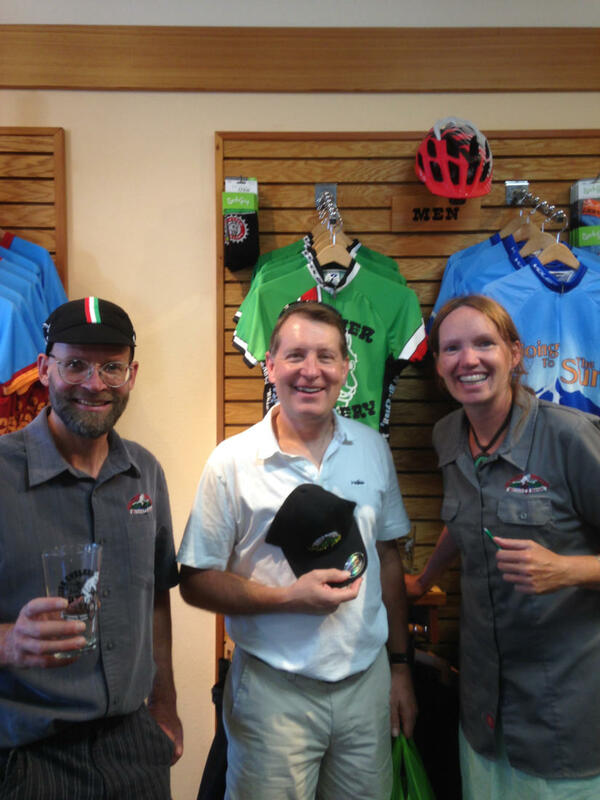 The staff at Glacier Cyclery was very supportive. The rest of our group, which included Roanokers Barbara and Gary Butcher, Gretchen Weinnig, Andy Beedle, Katharine Wells, Porter Peery, Karen Deer and Steve Ruhf, also found Whitefish to their liking. 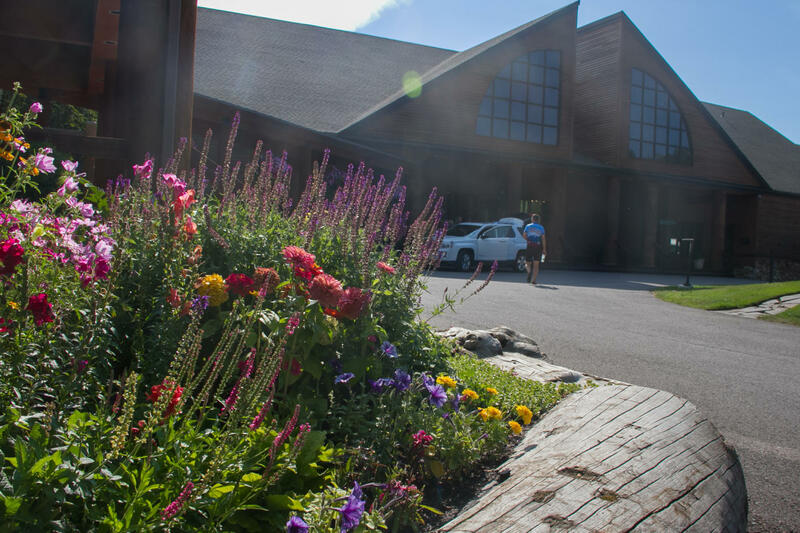 I had brought along two packable fly rods and received excellent advice at the Lakestream Fly Fishing Shop, where my need to return to Whitefish for outdoor activity was once again affirmed. As tempting as it was to schedule a trip on one of the local rivers, Gary bought some leaders and floatant and we departed hoping we might sneak away from the bike tour for a couple hours in the coming days to fool a trout. 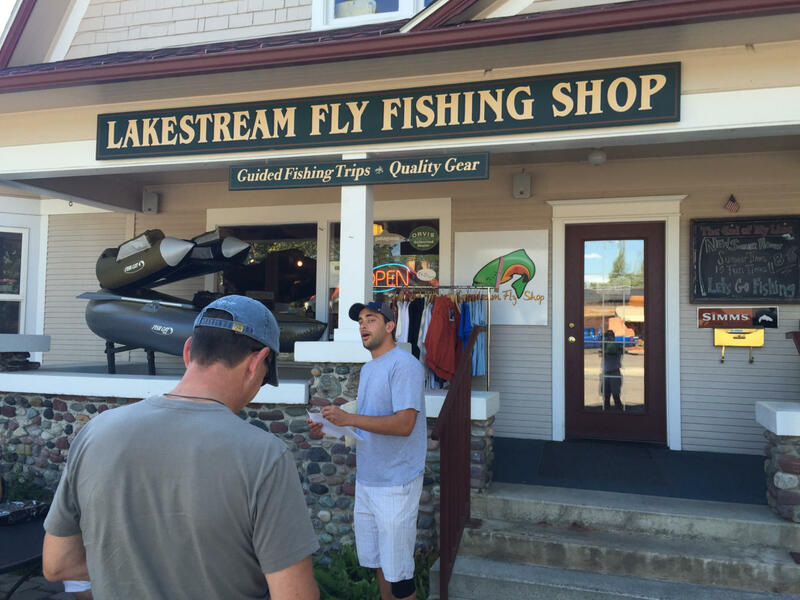 The Lakestream Fly Fishing Shop was perfect for what we needed. Just outside the fly shop we ran into a graduate student named Evan Tipton who was researching Whitefish’s sense of place – trying to determine how the small outdoorsy town fit into the big picture, and how it might market itself better. Evan has ties to Virginia Tech. (It’s a small world) and I shared with him how Roanoke, in it’s own way, was trying to solidify its niche in the outdoor world. I agreed to share some of my thoughts with him as well as a few photos. Hopefully he will gain some insight from me and/or our group, and perhaps we can learn something from him and his project. We ate dinner that night at the Craggy Range Bar and Grill, which quickly became my favorite – though in fairness we simply didn’t have time to try many of the other places, and some were booked even though we attempted to make reservations. The next morning at 10 a.m. the crew from Backroads Bicycle Tours met us in the parking lot of the Grouse Mountain Lodge. They pulled in with our bikes on the roof of their vans, and a trailer for our luggage. As our group gathered in the lobby, other cyclists who would be joining us appeared, including a large group from New England – primarily Boston and Providence – who had done several Backroads tours. Several sported jerseys indicating they had accomplished some famous climbs often featured in the Tour de France including Mont Ventoux and Alpe d’Huez. The competitive nature of cycling can never be fully quashed and there is no doubt that many — there in the hotel lobby, were taking measure of the others, wondering what kind of shape they were in and who would be among the stronger riders. I will admit at least that I was. The team from Backroads picked us up at the Lodge. The Backroads people introduced themselves as Katie, Brandon and Whitney and began what would be a week of taking care of our every need. They loaded our luggage, then gathered us in a circle where they described the adventure ahead and answered basic questions. After we signed a few more release forms – they loaded us in the vans and we were off for a 45 minute ride to the entrance of Glacier National Park. After months of planning and waiting, we arrived at Glacier National Park. Over the next few days we would see mountains, wildlife, lakes and vistas like I had never before experienced. There would be Saskatoon pancakes and huckleberry ice cream. We would ride challenging routes until our legs cramped, only to be met with a beer and a smile and the promise of an amazing dinner. One of our rides would be the ascent of the iconic Going to the Sun Road. All of that will be spelled out in several blog posts over the next two to three weeks. Thanks for coming along. Posing for a picture at Lake McDonald before our first ride. Andy Beedle, Gretchen Weinnig, John Carlin, Mary Carlin, Barbara Butcher, Gary Butcher, Karen Deer, Steve Ruhf, Porter Peery and Katharine Wells. I ride mountain and road bikes in the rugged country surrounding my home in Roanoke, Va. Photography, writing, and social media are sources of enjoyment for me, so this blog is really a guilty pleasure. According to Strava (and most group rides!) I'm an an intermediate cyclist. My bikes include a 2015 Guerciotti Alero, and a 1996 Waterford steel road bike. Off road, it's a Cannondale Trigger 3. Like most of you, I'm always dreaming about the next bike to join the stable. So many bikes, so little time. Please follow me on Strava. © Copyright 2017. Site setup by 23 Hearts Media.